The library collections of The New Jersey Historical Society contain manuscripts, rare and reference books, photographs, maps, broadsides, pamphlets and other materials that document the cultural and historical heritage of New Jersey from the colonial era through the 20th century. The collections form the most comprehensive, privately-funded library on New Jersey’s past. The library is open to the public and serves a diverse clientele including scholars, students of the humanities, local historians, genealogists and others. Documenting each phase of New Jersey’s state and local history, the library’s books, pamphlets and broadsides consist of histories, biographies, and reference works ranging from the earliest publications in the state to the most current. The rare book collection includes over 1,000 pre-1850 imprints and documents the early history of printing in New Jersey. The pamphlets and broadsides collected by the Historical Society document the social, cultural, and political history of the state by illustrating not only state-wide concerns, but also national issues and concerns from the 18th-century to the present. Other published works in the library include newspapers, periodicals, and The New Jersey People and Places vertical files. The newspaper collection, beginning with the 1777 New Jersey Gazette, offers first-hand accounts of the events that have shaped the state’s history. Newspapers are maintained on microfilm and in their original form. The periodical collection includes both old and current journals, newsletters, and magazines for organizations such as churches, clubs, schools and the activities of local governments. 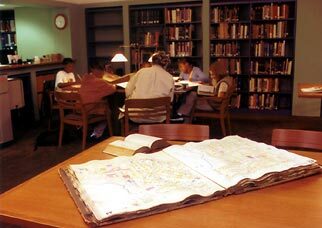 The Library also has resources such as city directories, local histories, and vital records, original church records, and special indexes to New Jersey materials that aid family historians. The library’s map collection documents the transformation of New Jersey’s rural and urban areas over the last three centuries. The more than 2,000 maps include a number of 17th century Dutch maps, Abel Buell’s 1783 map showing the boundaries of the emerging states; “A Mapp of New Jarsey” by John Seller and William Fisher (1677) and William Faden’s 1777 “Map of the Province of New Jersey, divided into East and West.” More recent maps such as city street maps, highway maps, and topographical maps of the state are also in the collection. Want to be an expert at our library before you arrive? To search for published materials, search Clavis, the catalog of the Newark Public Library. Under Step 3, select New Jersey Historical Society. Please bear in mind that we are currently undergoing an inventory of our collections and the catalog is constantly being updated and improved. Please contact the library staff at library@jerseyhistory.org with any questions about using the online catalog. Use the Guide to Our Card Catalogs and Library Map to aid in finding materials and check out our Library Use Policies to know the regulations we have in place to assist patrons and preserve our collections. Learn more about the Library’s holdings through our finding guides covering specific ethnic groups or collection types. We have various library services available for those unable to visit the metro area.